It seems long and long ago since the Jinny books were part of me … I have been reading them again, mostly with a grin on my face. Dear Jinny! And Shantih! She was all dream. 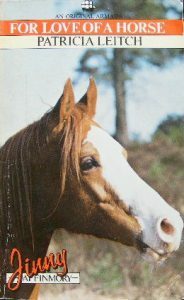 In fact, I used to dream about the chestnut Arab mare long before I wrote about her. Perhaps this letter will bring her back, and Bramble who was real flesh and blood, my own Kirsty. I still feel, if I could walk out onto the moor and call her she would hear and come galloping over the skyline to me. But then what is imagination for if not to call up the past? Pat was a keen childhood reader, and read everything she could get her hands on. The books which made the most impact on her, or at least the ones she remembers reading most, were Peter Pan and Black Beauty. She wanted to write from childhood, and started writing while she was working as a librarian. Her first book was To Save a Pony, published in 1960. 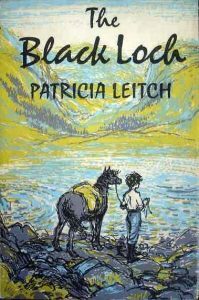 It didn’t take long until Pat’s interest in Celtic mythology surfaced in her writing: The Black Loch, (1963) an atmospheric tale of a mysterious black horse guarded over for generations by a Scottish family was one of her more popular books, and was reprinted several times, changing its title slightly in the process. Like writing, Celtic mythology was something that had interested Pat for many years, and this book was a way for her to combine the two. Although the mythological element didn’t surface until some books in, the fantastic was part of the Jinny series as well. Collins initially asked Pat to write three books about a girl and her horse, and so Jinny, her Arabian mare Shantih (meaning Peace) and their adventures galloping about in wild Scotland were born. Up until these books appeared, Pat’s books were popular, but it was the creation of Jinny which put Pat firmly in the forefront of pony literature. Jinny was an altogether different thing to previous pony book heroines: Ruby Ferguson’s Jill was at heart, sensible (though also opinionated) and Josephine Pullein-Thompson’s Noel was diffident and not at all the sort of person you could imagine careering off across the moors. Jinny and her wild background are very well suited: the books just wouldn’t have been the same if they’d been set in suburban Chatton, scene of Jill’s adventures. Comparing the books to Emily Bronte’s Wuthering Heights is a little fatuous, but the books share the same sense of Nature as a wild thing, with a life all its own, which reflects the inner workings of their heroes. The Jinny books may have started off as a suggestion from Collins, but Jinny herself very soon took hold of the series. Pat speaks of her as if she is alive, and perhaps that’s why Jinny has had such a marked effect on her readers: like her or loathe her (and there are passionate followers of both camps) you absolutely cannot ignore her. She is headstrong, stubborn, brave, and at times unbelievably irritating, but as a character she obviously lived to Pat, and whatever you might think about Jinny, as you read the books, you can’t help but believe in her. The series is so convincing it’s difficult to believe that neither Jinny nor Shantih had any existence other than in Pat’s imagination. There never was a Shantih. Pat hadn’t even met an Arabian when Shantih careered into existence. Love Highlands and Fells though I do, you couldn’t generally call them romantic, fiery creatures, elegantly stalking across the landscape, but some of Shantih was born out of Pat’s experiences with her own pony, Kirsty. Kirsty was a 14 hh Fell x Highland cross (probably!) who ran on the moor until she was around five, and was sent to a farm in West Kilbride as part of a debt. The farmer wanted Kirsty to pull a float, and to be a riding pony for his son, but the boy outgrew her. Poor Kirsty was kept in a stable day and night and nothing was ever done with her. The effect of this imprisonment was so traumatic she never got over it, and had to live out permanently as a result. Eventually the farmer decided to sell Kirsty, and Pat bought her unbroken. Kirsty was a pretty major challenge to break, and nearly broke Pat, but they settled down together, and spent hours riding the moors above Kilmalcolm. Kirsty much more recognisably inspired Bramble, the Highland who acts as such a contrast to Shantih in the books. Kilmalcom is part of the setting for the Jinny books, but only part. If you want to go looking for the locations you’ll have to be prepared to travel, as the setting is actually a combination of two different places. Finmory House, the house to which Jinny and her family move, is on the Isle of Skye, and is the house at which Pat worked as a housemaid for several summers. The moors around Finmory are in Renfrewshire, around the village of Kilmalcolm. This was where Pat kept Kirsty and rode herself. Kirsty was kept at Margaret’s Mill, a little riding school run by Willie Ross, where Pat worked for a while as a riding instructor. Jinny is passionate about many things, and I’d often wondered when reading the books why she didn’t become a passionate vegan like Ken. The reason is quite prosaic: there really was a Ken, and he already was a vegan (and a bit of a hippy) and having two vegans probably wouldn’t have worked! Ken was not the only real person in the books: Miss Tuke, the sometimes stern owner of the trekking stables, was based on Miss Jean Spence, who had her own training yard in Kilmalcolm. Unlike Miss Tuke, Miss Spence had some very good dressage horses. It’s a tantalising fact, but there could have been more Jinny books. The series only ended because Collins (who published Armada books), were taken over, and after they became Harper Collins the series was dropped. As Pat didn’t know any other writers, or have anyone to advise her, she didn’t take the series to another publisher. She wasn’t too unhappy with the way the series ended, and although she briefly considered a book about Jinny going to art school, or Shantih having a foal, she didn’t feel that it would work as a story, or be in the spirit of the books, and so the series ended, with Jinny as the perpetual teenager, untamed by life. This interview originally happened in 2008. Many thanks to Lorraine, who visited Pat in the Care Home where Pat used to live, and who kindly asked the questions on my behalf. Pat’s favourite book of those she wrote was Dream of Fair Horses, the story of Gill, her family and the beautiful grey show pony Perdita. Pat had written an earlier pony book (Riding Course Summer) which defied the girl-gets-pony convention, and this is another. Dream of Fair Horses was never planned to end happily ever after: it was, she thought the best written of her books. Besides writing under her own name, Pat also wrote four short books under the name Jane Eliot, which were published in Collins’ Spitfire series in the 1960s. These really are pocket sized books, being only 5 ½ x 3 ½ inches. 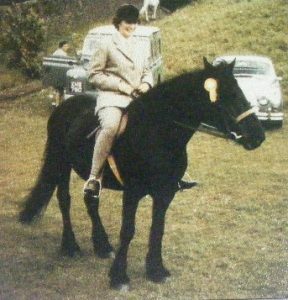 Pat was a qualified primary school teacher, and also worked as a librarian, a riding instructor at Margaret’s Mill and a dog trainer and handler.